Many people were happy with the fashionable design of the New Balance Fresh Foam Lazr Hyposkin. The interior of this shoe was appreciated for providing a smooth and sock-like fit. Some consumers welcomed the midsole foam because it gave a comfortable underfoot experience. Most of those who have tested it felt that it was true to size. The breathability of the upper unit gained positive remarks. Some people were taken aback that the colorway of the actual product was different from what’s advertised in websites’ photos. 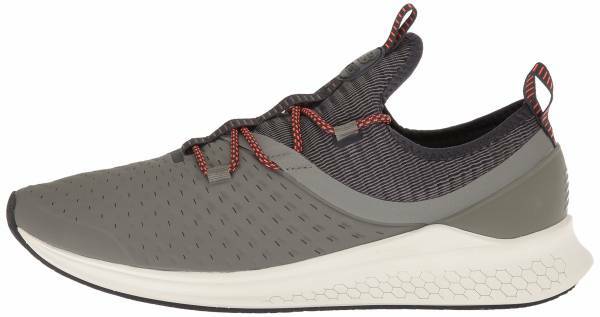 The New Balance Fresh Foam Lazr Hyposkin was welcomed as one of the contemporary shoes that’s good for running and casual walks. They felt that it was a comfortable option for their daily activities. It’s also worthy to note that the breathable upper and the regular sizing scheme worked well. The caveat is that the color options didn’t match the ones in the online photographs. Even when not running, the New Balance Fresh Foam Lazr HypoSkin to be great for everyday wear. The HypoSkin molded to the shape of the feet, and the Fresh Foam makes the feet comfortable, without aches or soreness, for hours. The New Balance Fresh Foam Lazr Hyposkin is a running shoe that’s birthed from data taken from runners in sports research labs. The upper and midsole were configured to accommodate the natural bending capacity, speed, and shape of the human foot. Hyposkin is a new upper technology that is made up of stretchable and breathable materials. It’s designed to offer a sock-like fit to the wearer. Laser-cut grooves are fashioned on the sides of the sole unit. These thin cuts allow the foot to feel a springy and responsive ride. A rubber compound shields the full-length foam from wear and tear. The New Balance Fresh Foam Lazr Hyposkin was designed using standard measurements, as well as data acquired from runners and footwear enthusiasts. The available widths for the women’s version are B – Medium and D – Wide, while the men’s iteration has the D – Medium and 2E – Wide options. The semi-curved shape of the platform accommodates the natural curvature of the human foot. A rubber compound is layered below the foam unit of the New Balance Fresh Foam Lazr Hyposkin. The purpose of this material is to protect against the abrasive nature of the surfaces. It also delivers traction. There are hexagonal patterns across the entire outsole. The narrow grooves between these shapes allow the sole unit to bend in conjunction with the foot of the wearer, thus giving an enabled underfoot experience. Fresh Foam is a cushioning material that’s meant to carry the foot and keep it safe from impact while also giving a responsive ride. It has been laser cut at the sides to implement flexibility further and heighten the springiness of the ride. The Fresh Foam technology has been used in 1080 v9 and other well-known New Balance running shoes. The medial and lateral sections of the platform rise a bit to help the upper unit in keeping the foot in place. Hyposkin is a feature that’s crafted to offer a sock-like coverage to the foot of the runner. Smooth and stretchy fabrics help in accommodating this claim. Moreover, tiny ventilation holes permit airflow into the foot-chamber. A two-way stretch collar makes the runner feel like wearing a sock. It doesn’t have a separate tongue unit, but it has a protrusion in the instep to maintain the feel of a traditionally shaped upper. Round laces loop through fabric bands on the instep; they enable a secure yet customizable fit. Pull tabs are stitched to the one-piece tongue as well as the heel. These stubs help the runner when it comes to wearing and removing the New Balance Fresh Foam Lazr Hyposkin.